Brown took down a news article about the study on "rapid-onset gender dysphoria," a phenomenon where teens in a friend group who never experienced questions about their gender before, suddenly identify as transgender at the same time. This occurs typically after a flood of social media use, and binge-watching YouTube videos about transitioning. The Daily Wire first reported Brown's removal of its transgender research. The Ivy League university claims it is still committed to "academic freedom." "In on-line forums, parents have been reporting that their children are experiencing what is described here as ‘rapid-onset gender dysphoria,' appearing for the first time during puberty or even after its completion," wrote the study's author Lisa Littman, an assistant professor in behavioral sciences at Brown. "The onset of gender dysphoria seemed to occur in the context of belonging to a peer group where one, multiple, or even all of the friends have become gender dysphoric and transgender-identified during the same timeframe." The study was published in PLOS One, a peer-reviewed science journal, earlier this month. The study was based on 256 parent-completed surveys. Over 62 percent of the teens had previously been diagnosed with at least one mental health disorder or neurodevelopmental disability. Parents reported their children "exhibited an increase in social media/internet use prior to disclosure of a transgender identity." Findings led to the hypothesis that "friends and online sources could spread certain beliefs." For instance, parents said they witnessed "clusters of gender dysphoria outbreaks" in their children's friend circles "in a pattern that seems statistically unlikely based on previous research." "Parents describe a process of immersion in social media, such as ‘binge-watching' Youtube transition videos and excessive use of Tumblr, immediately preceding their child becoming gender dysphoric," according to the study. The findings raise "the possibility of social and peer contagion," or teens influencing each other to promote certain emotions and behaviors. Peer contagion has been previously linked with influencing depression, eating disorders, and drug use. 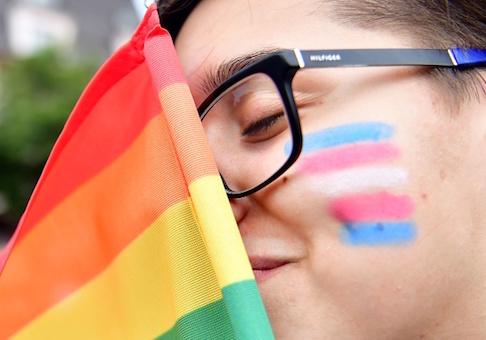 "In the past decade, there has been an increase in visibility, social media, and user-generated online content about transgender issues and transition, which may act as a double-edged sword," Littman wrote. "On the one hand, an increase in visibility has given a voice to individuals who would have been under-diagnosed and undertreated in the past. On the other hand, it is plausible that online content may encourage vulnerable individuals to believe that nonspecific symptoms and vague feelings should be interpreted as gender dysphoria stemming from a transgender condition." Littman did not say her study was definitive and advocates for more research. "Descriptive studies aren't randomized controlled trials—you can't tell cause and effect, and you can't tell prevalence," she told Science Daily. "It's going to take more studies to bring in more information, but this is a start." The preliminary findings, however, go against "gender affirming care," which advocates gender transitioning in all cases, at all ages. Brown published a news article on its findings on Aug. 22. The article was taken down five days later. Brown University said it removed the news article about its own study's findings after "community members" complained that the study's results were anti-transgender youth. Though Brown censored academic findings from its own behavioral scientist, the school claims it affirms the "commitment to academic freedom." "The School of Public Health has heard from Brown community members expressing concerns that the conclusions of the study could be used to discredit efforts to support transgender youth and invalidate the perspectives of members of the transgender community," said Bess Marcus, the dean of Brown's School of Public Health in a statement on the controversy. "The University and School have always affirmed the importance of academic freedom and the value of rigorous debate informed by research," Marcus said. Marcus added that all research "should be debated vigorously" to further the "spirit of free inquiry and scholarly debate." Marcus admitted, however, the school sided with the diversity and inclusion office over its behavioral study. "The spirit of free inquiry and scholarly debate is central to academic excellence," she said. "At the same time, we believe firmly that it is also incumbent on public health researchers to listen to multiple perspectives and to recognize and articulate the limitations of their work." Marcus reiterated that "diversity and inclusion" is "central" to Brown's mission. "Our faculty and students are on the cutting edge of research on transgender populations domestically and globally," Marcus continued. "The commitment of the School to diversity and inclusion is central to our mission, and we pride ourselves on building a community that fully recognizes and affirms the full diversity of gender and sexual identity in its members." This entry was posted in Culture and tagged Education, Transgenderism. Bookmark the permalink.